Jun 27 – St Cyril of Alexandria, (376-444), Patriarch of Alexandria, Father & Doctor of the Church, Pillar & Defender of the Faith, A Man’s Man of Christian Love | ADULT CATECHESIS & CHRISTIAN RELIGIOUS LITERACY IN THE ROMAN CATHOLIC TRADITION: hosting ONLY True Christians!! !, or "How to think Catholic!!" After taking a look at the life of St. Cyril, it’s easy to see him as a man who always came into a situation with both barrels blazing. Seriously, Cyril took no prisoners. Cyril was born at Alexandria, Egypt. He was nephew of the patriarch of that city, Theophilus. Cyril received a classical and theological education at Alexandria and was ordained by his uncle. He succeeded his uncle Theophilus as patriarch of Alexandria on Theophilus’ death in 412. Before Cyril became Patriarch, he had to survive a riot that ensued due to a rivalry for the Patriarchy with his rival, Timotheus. Thus, Cyril followed his uncle in a position that had become powerful and influential, rivaling that of the Roman prefect. When he became Patriarch of Alexandria in 412, he “assembled a mob” that plundered and closed the churches of the Novations1. Novations had been persecuting Christians in the area. Cyril also drove out of Alexandria the Jews, who had formed a flourishing community there since Alexander the Great. The Jews of Alexandria were also political backers of the Roman Prefect of Alexandria, governor of the Roman Diocese (political, not ecclesiastical) of Egypt. Expulsion from a territory was a secular power that belonged to the pagan Roman Prefect. But the Jews had caused tumults and had massacred the Christians. Expelling their enemies may have been the only possible defense for the Christians. The Roman Prefect of Egypt, Orestes, though was very angry at Cyril for usurping power that was his. Cyril offered Orestes a Bible; a gesture which would mean Orestes’ acquiescence to Cyril’s religious authority and policy, which Orestes rejected. Yes, you guessed it, a serious brawl ensued as a result of the conflict between Cyril and Orestes. 500 (yes, five hundred) monks came swinging out of the lower deserts of Egypt (Nitria) to defend Cyril. Can you imagine 500 men with big beards and worn-monastic habits storming into a fight against Orestes’ soldiers? One word comes to mind: Fortitude. One of the monks, Ammonius, actually beamed Orestes with a rock during the skirmish. Orestes had Ammonius tortured to death. Cyril actually honored the remains of the rock lobbing monk for a time. Prefect Orestes enjoyed the political backing of Hypatia, a pagan female astronomer, philosopher and mathematician who had considerable moral authority in the city of Alexandria, and who had extensive influence. Indeed many students from wealthy and influential families came to Alexandria purposely to study privately with Hypatia, and many of these later attained high posts in government and the Church. Several Christians thought that Hypatia’s influence had caused Orestes to reject all reconciliatory offerings by Cyril. Modern historians think that Orestes had cultivated his relationship with Hypatia to strengthen a bond with the pagan community of Alexandria, as he had done with the Jewish one, to handle better the difficult political life of the Egyptian capital. A Christian mob, however, led by a lector named Peter, took her from her chariot, dragged her to a church and tore her flesh with potsherds till she died, finally burning the pieces outside the city walls. Cyril did not support this action and it caused him much embarrassment and political difficulty after the fact, but since this Peter was only a lector, and not a member of the clergy, Cyril could distance himself from this event. Cyril, in league with Pope Celestine I, is most known for intellectually duking it out with Nestorius, who was the Patriarch of Constantinople (present day Istanbul). At one point, the Emperor (Theodosius II) had both Nestorius and Cyril arrested. 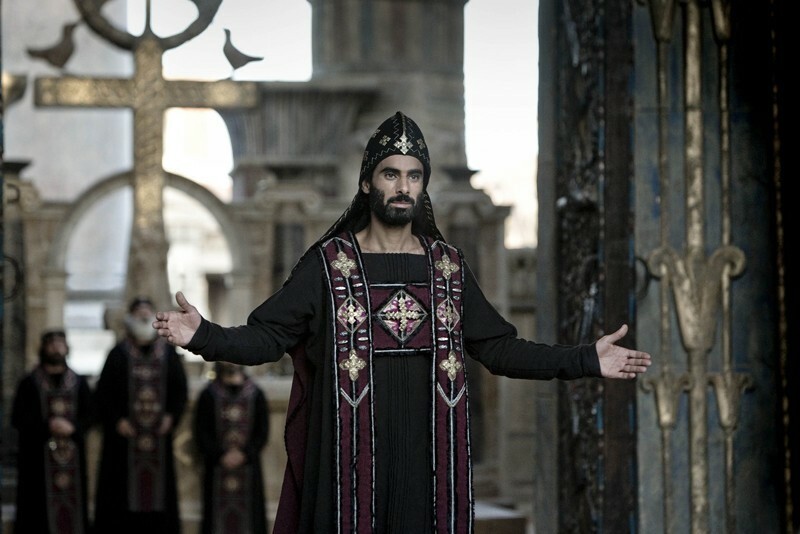 The emperor, however, cut Cyril loose after Papal Legates showed up on his doorstep saying that Pope Celestine endorsed Cyril’s condemnation of Nestorius. Cyril was the bedrock for the third general Council of Ephesus in 431, which declared Nestorianism a heresy. Oddly enough, a group of bishops that sided with Nestorius convened their own council after the one at Ephesus and deposed Cyril (this is the point where Cyril and Nestorius got arrested by the Emperor). The exegetical works of St. Cyril are very numerous. The seventeen books “On Adoration in Spirit and in Truth” are an exposition of the typical and spiritual nature of the Old Law. The Glaphyra or “brilliant”, Commentaries on Pentateuch are of the same nature. Long explanations of Isaiah and of the minor Prophets give a mystical interpretation, after the Alexandrian manner. Only fragments are extant of other works on the Old Testament, as well as of expositions of Matthew, Luke, and some of the Epistles, but of that of St. Luke much is preserved in a Syriac version. Of St. Cyril’s sermons and letters the most interesting are those which concern the Nestorian controversy. Of a great apologetic work in the twenty books against Julian the Apostate ten books remain. Among his theological treatises we have two large works and one small one on the Holy Trinity, and a number of treatises and tracts belonging to the Nestorian controversy. “Hail, Mary, Mother of God, venerable treasure of the whole universe, lamp that is never extinguished, crown of virginity, support of the true faith, indestructible temple, dwelling of Him whom no place can contain, O Mother and Virgin! Through you all the holy Gospels call blessed the One whom comes in the name of the Lord. 1Novation was born about the year 200. He was a man of considerable learning, apparently educated in literary composition; the first writer to use Latin in the Church. 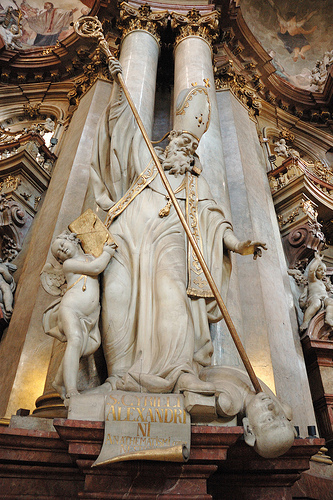 His immediate rival in Rome, Bishop Cornelius, spoke of him sarcastically as ” that maker of dogmas, that champion of ecclesiastical learning”. During the persecutions of emperor Decius in mid third century, Novatian took the position that those who had stopped practicing Christianity, the “Lapsi”, during the persecutions, to save themselves, could not be accepted back into the Church even if they repented and that the only way to reenter the church would be by re-baptism. Cornelius and Cyprian of Carthage did not believe in the need for re-baptism. Instead they thought that the sinners should only need to show contrition and true repentance to be welcomed back into the church. During the election of the bishop of Rome in 251, Novatian opposed Cornelius because he was too lax in accepting the return of Christians who had lapsed during the persecutions. His party then consecrated him as a rival bishop (antipope) to Cornelius. He announced throughout the empire his election, as had Cornelius, as both parties appointed bishops and priests in cities where the incumbent favored his rival, thus creating a widespread schism in the Church. By the end of 251, Bishop Cornelius assembled a council of sixty bishops that condemned and excommunicated Novation apparently over the legitimacy of his claim to the ecclesiastical throne of Rome. It was only later that Novation began to be called a heretic and this appeared to be over the question of the Church having the power to grant absolution in certain cases. Novatian is known for his writing of which only two have survived, the De Cibis Judaicus and De Trintate (On the Trinity), an interpretation of the early church doctrine on the Trinity which is his most important work. Novationists called themselves καθαροι (“katharoi”/Cathari) or “Puritans” reflecting their desire not to be identified with what they considered the lax practices of a corrupted Catholic Church. They went so far as to re-baptize their own converts. Because Novatianists (including Novatian) did not submit to the bishop of Rome, they were labeled by Rome as schismatics. Novations were Montanists, another name for a heretical group, who took their name from a priest and Anti-pope, Montanus. Montanus preached that those who fell from grace were out of the church forever, as opposed to the orthodox position that by sincere contrition and repentance the fallen might be readmitted. In addition they believed that the value of the sacraments depended on the purity and worthiness of the priest administering the rites. In time they merged with the Donatists who sprang up in Carthage, 4th century in a split with Rome over the failure of a their man to win the bishop’s seat. The Novations also held second marriages were not valid.